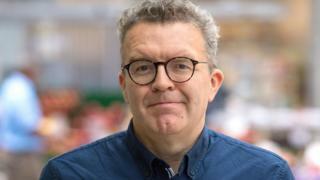 Image caption Tom Watson said Andew Murray's claimed sounded "a bit John le Carre"
Labour's deputy leader has dismissed a suggestion by one of Jeremy Corbyn's advisers that the "deep state" is working to undermine him. 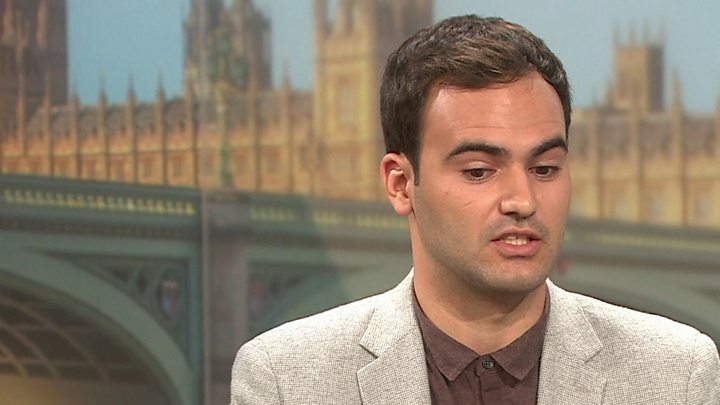 Andrew Murray has claimed someone "being paid by the taxpayer" could be behind newspaper reports of him being banned from Ukraine and a delay in securing a pass to work in Parliament. Deputy leader Tom Watson said the claims were "a bit John le Carre". Mr Watson said Mr Murray should provide evidence to back up his case. Mr Murray is a former communist and longstanding union official who is a part-time adviser to Mr Corbyn. Writing in the New Statesman, he said he had learned of his ban from Ukraine - reportedly for being suspected of being part of "Putin's global propaganda network" - by reading the Mail on Sunday. He said he was "no admirer" of the Russian president's regime and that he had no desire to visit Ukraine. Questioning how news of his ban had emerged, he referred to the "manoeuvrings of what is now called the 'deep state'". "Call me sceptical if you must, but I do not see journalistic enterprise behind the Mail's sudden capacity to tease obscure information out of the SBU [Ukraine's security service]." He went on: "Someone else is doing the hard work - possibly someone being paid by the taxpayer. "I doubt if their job description is preventing the election of a Corbyn government, but who knows? We are often told that the days of secret state political chicanery are long past and we must hope so. "But sometimes you have to wonder - this curiously timed episode seems less rooted in a Kiev security scare than in a political stunt closer to home." Mr Watson, asked about the comments on BBC Radio 4's Today programme, said: "I think it's highly unlikely but I don't know, I read that piece, I thought it was a bit John le Carre but I don't know where his evidence is for that." He added: "If he thinks the intelligence services are in some way trying to undermine the official Opposition then he should provide evidence, otherwise it's just fake news." Security Minister Ben Wallace also dismissed Mr Murray's claims, tweeting that Britain's spies were too busy trying to prevent terrorism than "pumping out stories to the Mail on Sunday about someone no one has ever heard of".